Mansion Poker Bonus Code: ftrbonus Will Give You 200% up to $2,000! By signing up with Mansion Poker through FlopTurnRiver you will be eligible for a great first deposit bonus. Be sure to set yourself up for the best promotions possible by entering the code ftrbonus when creating your account. Look at the screenshot above to see where you should enter your code. By using our links and entering the Mansion Bonus Code ftrbonus in the appropriate section of the registration form, you’ll be able to receive a 200% bonus up to $2,000! Players using other currencies can get up to €1,500 or £1,200. Every time you accumulate 500 Status Points, you’ll receive a $5 increment of your bonus. Euro players must gather 667 Status Points to get each €5 bonus portion while those players using pounds must earn 800 points per £5 of bonus. If you max out your bonus at $2,000, then you’ll need to collect 200,000 points, and your bonus will be released in 400 installments of $5 each. You’ll have 30 days from the time of your first hand of poker at Mansion to unlock the bonus. Any bonus amount that’s not released within this period of time will be forfeited. Once you deposit at Mansion Poker, you’ll be able to enter quite a few freerolls. There’s the monthly $2,500 New Depositors Freeroll as well as the $250 Weekly Depositors and $250 Weekly Depositors Omaha freeroll tournaments. You’ll be entitled to enter each of the above tourneys once. In addition, you’ll be able to enter four $25 Bankroll Builder freerolls every seven days for the first 90 days after you’ve signed up for an account. 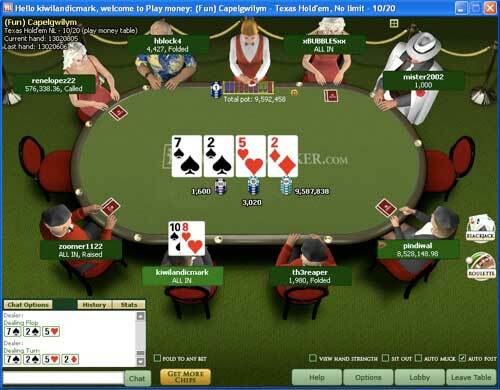 The Bankroll Builders are available in both Hold’em and Omaha formats. As you play poker at Mansion, you’ll be credited with Status Points based upon rake and tournament fees paid. Every dollar of rake or fees will grant you 15 points. Games denominated in euros will instead grant 20 points per €1 in fees and rake. Pound tables and tournaments will award 24 points for every £ in rake or fees. Assuming your account is denominated in dollars, you’ll have to earn 500 points, or rake $33.34, in order to clear every $5 piece of your bonus. This is a cashback rate of 15%. We would be remiss if we didn’t inform you of a way to achieve a better rate with your Mansion bonus. It turns out that Omaha cash games hold a privileged position at Mansion. For every dollar you pay in rake at the Omaha ring games, you’ll get 20, not 15, Status Points. This means that you’ll be able to reach your $5 bonus increment with every $25 in rake you pay, bumping your cashback rate up to 20%. In order to clear your full $2,000 bonus, you must rake $13,333 in most types of games or $10,000 at the Omaha tables. In either case, you’ll earn 200,000 Status Points while achieving this goal. You can fulfill these requirements by playing 4,445 $30 + $3 tournaments (including SNGs) or by grinding out close to 180,000 hands at the 100NL 6-max cash games. The clearing chart to the right will let you know how easy it is to earn your bonus at various games and stakes. The Mansion Poker $2,000 bonus will require time and commitment to fully unlock. Nevertheless, it does pay out in small pieces of $5, so you’ll probably be able to score a few increments of the bonus within the 30-day window even if you play at micro-stakes. The Status Points you receive at the tables will counts towards your progress in the Club Mansion rewards program. For every Status Point you earn, you’ll receive a number of Mansion Points that will increase the higher the level you achieve. Everyone starts out as a “Player,” but through diligent play, you can progress towards “Diamond.” Your VIP level at the beginning of every month will depend upon the number of Status Points accumulated in the previous month. You can use your Mansion Points to purchase cash and tournament tokens in the Club Mansion Store. 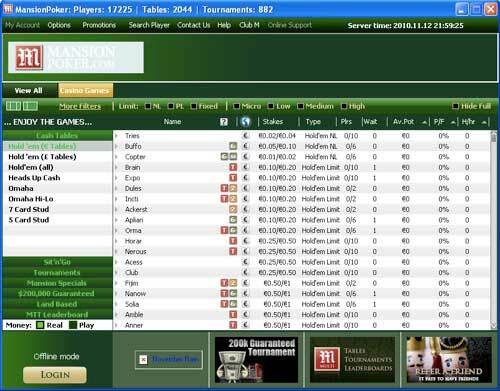 There are also exclusive freerolls that are open only to Club members at certain levels. Although you’ll have to rake a non-trivial $6,667 (or $5,000 in Omaha cash games) within a month to reach Diamond level, doing so will allow you to get up to 53% in rakeback equivalent. Get your $2,000 first deposit bonus along with your Club Mansion benefits by using our links below to sign up at Mansion Poker!